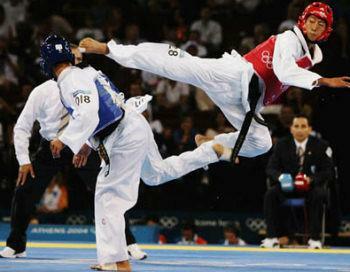 TAE-KWON-DO FOUNDATION, INDIA – TFI is the highest body stands as the Foundation of Taekwondo in India. Taekwondo in India is a most dynamic history, as Taekwondo under the leadership of top masters has been included in the Ministry of Youth Affairs & Sports, Govt. of India, Indian Olympic Association – IOA, Sports Authority of India, School Games Federation of India etc. There are thousands of Black Belt & certified players are practicing today and their counts growing day by day. Many small & micro level of Taekwondo organizations, clubs established in India but due to some political affairs the players unable to get the platform to participate in a quality level of championships. For the same reason Taekwondo Foundation-India has been established under the interference of the Taekwondo International Foundation-TIF to offer the suitable way & environment of Taekwondo Championship. It has offered Individual & Club Membership at a very lower price to unify all small & large Taekwondo Clubs, Institutes, Academies & Individuals. The National Level Academies / Federations / Associations wish to linked with this foundation will have to pay Rs.520/- per year.